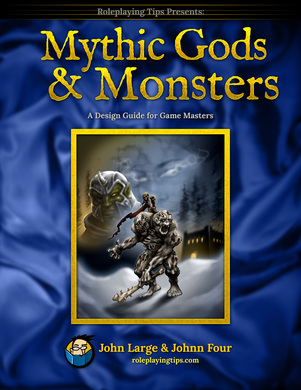 As a companion piece to my GM Tips – Making monsters monstrous video, please find below a quick checklist for creating monsters based on a mythological model, answering these questions will give a bit of extra background and interest to truly monstrous monsters. 1. How was the monster created? – A result of divine procreation with a mortal (answer question 2). – As a result of a curse (answer question 2 & 3). – Created by a great power for a specific purpose (answer question 2 & 4). – Monster is actually a form of lesser divinity or similar power (answer question 6). 2. If a divinity or higher power was involved in the creation what was the nature of the power involved? If the monster is the offspring of a god then it’s powers will be related to their parent although they will normally be reflected on the physical appearance of the creature. 3. Why was the mortal cursed? – Directly insulting the god. – Taking actions that directly oppose the god. – Wronging loyal servants of the god. – Mis-using a talent/abilities granted by the god. Example: The god of sleep may trap a cursed person away from the waking world allowing them only to communicate in dreams, or perhaps they cause bad dreams and trouble sleep wherever they go (making people irritable and causing them to turn on the cursed individual). 4. What purpose was the monster created for? – To punish those who oppose the gods. – To guard something precious (also answer question 5). Monsters created to punish someone are normally specifically tailored to deny those being punished some aspect of their life that they value or require, without simply killing them. Creatures created to guard something precious are normally encountered only in the vicinity of the thing that they are guarding and have senses that cover the area, making it very difficult to sneak up and purloin their treasure. However, most such creatures have a method via which safe access to their charge can be obtained incase the gods should seek to send a favoured servant to acquire the item. Example: The god of sky creates a giant eagle to guard one of his thunderbolts, the bolt lies in a huge nest constructed by the beast on an impossibly tall mountain. Example: The god of sleep creates a monster to punish a debauched town of celebrants, the creature pursues them through dreams which begin pleasant and turn to nightmares, causing them to wake without the benefit of rest. 5. Where is the precious item located? – In a faraway land. – In a geographical inaccessible place (the bottom of an ocean, the top of a mountain). – Protected in a hidden demi-plane accessible only via a portal or when specific conditions are met. – The item is located inside or is part of the creature itself. 6. Which deity is the creature related to or affiliated with? – Pick one of the deities from question 2 (or add your own). – Then choose a more specialised/specific element that might fall under their portfolio (ie. clouds for sky, nightmares for sleep, vanity for beauty, etc). – A lesser divinity will have powers and abilities related to it’s specific portfolio, these will be reflected on it’s physical form to a lesser degree. Example: Related to the war god, a lesser-divinity of violence & fury may appear as a huge man with bulging muscles, glowing red eyes and a permanent expression of fury. By making choices from this list and thinking about the various elements you should be able to create a monster in the style of the ancient greek/roman myths. Kalkedos killed his neighbour when the man rebuffed Kalkedos’ intent to woo his daughter, drowning the man in the swamps near his home. As he died the merchant, a loyal follower of his god, cursed Kalkedos and the god of merchants answered, lending power to the curse. Kalkedos was transformed into a lumbering, clumsy creature with warty skin, green the colour of envy, his mind twisted he gathers the filth of the swamp to him as his ‘riches’ blind to the fact that it is refuse and lashing out at another who dares try to steal from his treasure. If you produce any monsters using this system drop me a line about them either to reddicediaries@gmail.com, i’d love to see your creations.